During his time with the enigmatic Morian Zenas, Professor of Transliminal Arts at the Arcane University, Fyr attempted to win the heart of Zenas's fellow professor, Doctor Alfidia Lupus. Both wizards had an interest in Doctor Lupus, and she ultimately chose Zenas over Fyr. Fyr helped Zenas enter Moonshadow, from which the human wizard journeyed to various other planes of Oblivion until he became lost in Apocrypha, and Lupus came to believe that Fyr was responsible for Zenas's fate when she discovered that Fyr had summoned Hermaeus Mora from a ritual contained in the Fragmentae Abyssum Hermaeus Morus. Doctor Lupus went missing shortly afterwards. Divayth Fyr was a friend of Sotha Sil and enjoyed contemplating his riddles, as well as the contemplation of pain. Prior to the ascent of the Nerevarine in 3E 427, he believed that the Nerevarine Prophecy was impossible to fulfill. In his youth, Fyr dabbled in the forbidden art of necromancy, but he would eventually turn away from it to focus on other subsections of conjuration. He would grow tired of conjurers being generalized as necromancers and would write a book to educate the uninformed. Although he once displayed great skill with necromancy, he did not wish to utilize it to attain immortality. Circa the Interregnum, he was reputed to be popular among women and had been called a philanderer. Among other things, Divayth Fyr spent his time researching the Divine Disease, Corprus, and his Corprusarium was a refuge for anyone infected, including his oldest friend, Yagrum Bagarn, the last living Dwemer. He took a deep interest in Dwemer history and collected many Dwemer artifacts. Divayth Fyr has also been in possession of several Daedric artifacts. In the mid-Second Era he was given the Skeleton Key by Sotha Sil, to keep it safe, after Fyr helped foil a plot by the Daedric Prince Nocturnal to take over the Clockwork City. In the late Third Era he was in possession of Malacath's Scourge. He was willing to employ ruthless tactics, such as kidnapping, to achieve his ends. 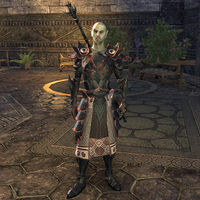 He is mentioned in the book The Doors of Oblivion, as well as Varieties of Daedra (written by a former apprentice), which assert that, before his interest in Corprus, Fyr traveled to the Daedric planes of Oblivion. He is also the author of at least two books. It is unknown if the old wizard survived the cataclysms of the Red Year, though Kellen claimed that Divayth's daughter Alfe Fyr had survived and moved to Skyrim, where the Forgotten Hero met her to negotiate for passage into the Clockwork City. For game-specific information on Divayth Fyr, see the Morrowind, Legends, and ESO articles. ^ a b c d e f Events of Morrowind. This page was last modified on 22 April 2019, at 00:18.